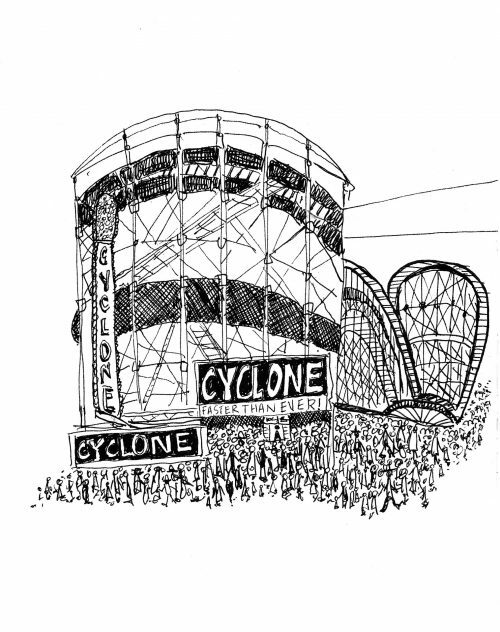 In the summer of 1927, New Yorkers flooded to The Cyclone, Coney Island’s newest ride engineered by inventor Harry C. Baker. “Let’s go for a wild ride,” they told their friends and family members. A giant chain slowly pulled the three-car train up the wooden tracks to the zenith — it was a rattly, herky jerky preview — before it quickly dropped at speeds of 68 miles an hour over nine more drops and six curves. New Yorkers stepped off the ride windswept and unsteady on their feet from the speed. 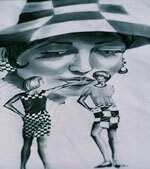 Drawing by Alison Garwood-Jones using a black Uniball pen.